We miss October. We are two of those people who love the art of carving pumpkins and telling ghost stories over hot apple cider, and all the holiday brings. I started writing this blog for myself, keeping track of all I see and do throughout the Halloween season, and have been joined by my haunted friend What a Witch in our quest to live our upstate New York Halloween to the fullest. We document all of our Halloween projects, products and anything we can find related to October 31 here. This blog is named after a phrase from one of my favorite, not necessarily Halloween-related poems, Edgar Allan Poe's "The Raven." Happy Haunting. ... from the Ghost. With fireworks and Jack Skellington courtesy of Disneyland's Halloween Screams Fireworks in 2009. "A Night on Bald Mountain"
A brief post. This weekend, I will be off in Sleepy Hollow, NY, for the first time in my life. I could not be looking forward to getting there more, and I do plan on blogging as much as I can while I am there. If, for some very possible reason, I don't get to blog while there, I know I will have a photo or two to blog about when I get home. This here pumpkin is the first I've bought this season. 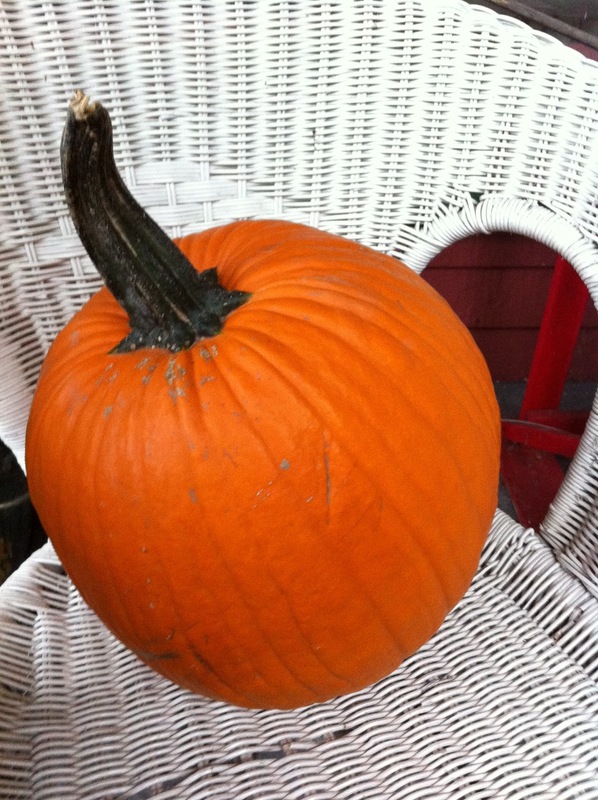 None of the pie pumpkins or jack o'lanterns I tried growing in the yard made it, and so I have broken down and begun buying pumpkins which seem to be good carving candidates. I have a few ideas what this may become. For the last few years, I've done some major carving projects, but only one or two a year, and always on Beggar's Night and Halloween itself. My goal this year is to start carving them earlier-- but not too early-- this year. Perhaps next weekend? Copyright 2009-2016 by Ghost Upon the Floor Blog. All rights reserved.